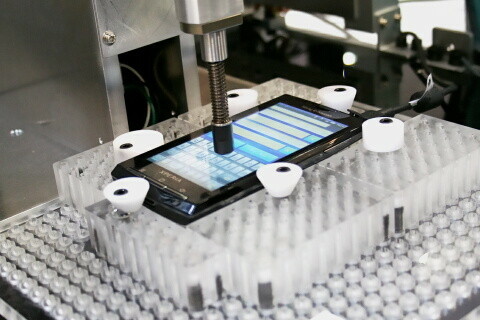 Tokyo-based Japan Novel Corp. is offering a robot that can simulate the process of flicking and tapping on a smartphone touch screen over and over again. Dubbed Quality Commander [JP], the machine can be programmed so that it touches the display of smartphones and perform said movements in lieu of a human. The Quality Commander also has a high-speed camera, which makes snap shots of the display every time it flicks or taps the screen to be able to control that the desired outcome is achieved. Apart from still images, it can also check if videos are being played (if that’s what supposed to happen after a tap, for example). There’s also a mic to check if the device being tested triggers a sound or melody after the robot simulates a certain action. Obviously, Quality Commander is aimed at hardware and software makers who can use it for testing or debugging purposes. Japan Novel says their six-joint robot can work 24 hours a day. The company is selling the Quality Commander in various versions, with the most basic one costing a hefty $70,000. A Quality Commander for conventional cell phones is much cheaper at $54,000.